Sometimes you’re happy. Sometimes you’re sad. Sometimes you’re good. Sometimes you’re bad. But there is always love between parent and child, which is the uplifting message in an exquisite new title from Emma Dodd. 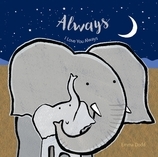 Featuring rhyming text and heartwarming illustrations of an elephant family, this padded board book makes a great addition to any nursery bookshelf. One little elephant discovers that a parent’s love is unconditional.